Gardening update! A little bit late, but look at my little garden! 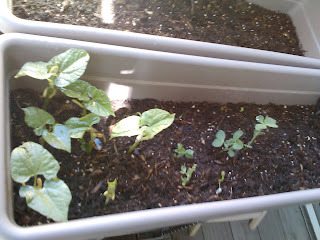 All the big ones at the end are green bean plants. They are going crazy! And the ones in the middle are pea plants. The mini carrots at the far end have yet to do anything. Isaac's planter is above mine in the picture. His is an herb garden so, even though you cannot see anything, there are several tiny oregano and basil plants growing (no spearmint as of yet). Sadly, our aloe plant, Barnabas is not doing as well, but I think that's due to all of the cold spells we've had. Once it warms up, I'm sure he will perk right up! Stay tuned! I hope our little gardens continue to grow and thrive!